During the past several decades, the United States has experienced its most sustained rise in inequality since the nineteenth century. The U.S. distribution of income and wealth is now wider than in most other advanced countries. To provide a factual basis for further discussion, this paper reviews trends in income and wealth inequality over the past several decades, and then discusses four significant sources of economic opportunity in the United States: the resources available for children in their most formative years, affordable higher education, private business ownership, and inheritances. The distribution of income and wealth in the United States has been widening more or less steadily for several decades, to a greater extent than in most advanced countries (Morelli, Smeeding, and Thompson 2015). This trend paused during the Great Recession because of larger wealth losses for those at the top of the distribution and because increased safety-net spending helped offset some income losses for those below the top. But widening inequality resumed in the recovery as the stock market rebounded, wage growth and the healing of the labor market have been slow, and the increase in home prices has not fully restored the housing wealth lost by the large majority of households for which it is their primary asset. 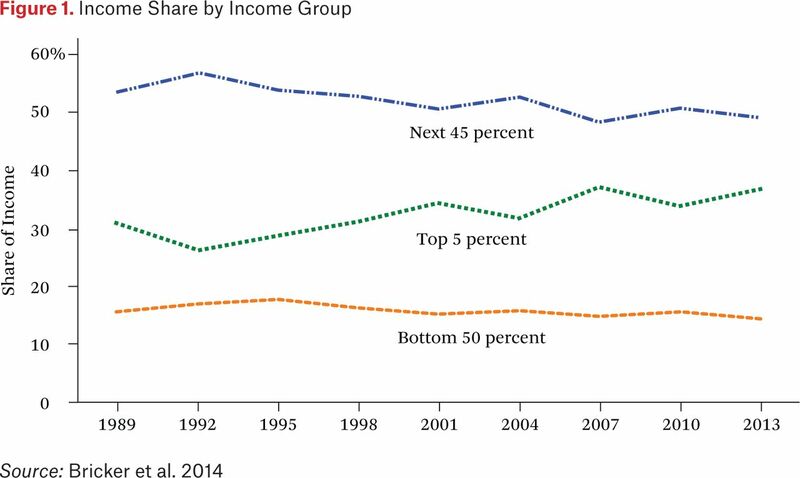 The extent of and continuing increase in inequality in the United States greatly concern me. The past several decades have seen the most sustained rise in inequality since the nineteenth century after more than forty years of narrowing inequality following the Great Depression. By some estimates, income and wealth inequality are near their highest levels in the past hundred years, much higher than the average during that time and probably higher than for much of American history before then (for income inequality, see Atkinson, Piketty, and Saez 2011; for wealth inequality, see Saez and Zucman 2014; for income inequality before 1913, see Lindert and Williamson 2012). It is no secret that the past few decades of widening inequality can be summed up as significant income and wealth gains for those at the very top and stagnant living standards for the majority. I think it is appropriate to ask whether this trend is compatible with values rooted in our nation's history, among them the high value Americans have traditionally placed on equality of opportunity. Some degree of inequality in income and wealth, of course, would occur even with completely equal opportunity because variations in effort, skill, and luck will produce variations in outcomes. Indeed, some variation in outcomes arguably contributes to economic growth because it creates incentives to work hard, get an education, save, invest, and undertake risk. However, to the extent that opportunity itself is enhanced by access to economic resources, inequality of outcomes can exacerbate inequality of opportunity, thereby perpetuating a trend of increasing inequality. Such a link is suggested by the Great Gatsby curve, the finding that, among advanced economies, greater income inequality is associated with diminished intergenerational mobility (Kreuger 2012). In such circumstances, society faces difficult questions of how best to fairly and justly promote equal opportunity. My purpose is not to provide answers to these contentious questions, but rather to provide a factual basis for further discussion. This volume more broadly focuses on equality of economic opportunity and on ways to better promote it. In this paper, I review trends in income and wealth inequality over the past several decades, then identify and discuss four sources of economic opportunity in America—think of them as building blocks for the gains in income and wealth that most Americans hope are within reach of those who strive for them. The first two are widely recognized as important sources of opportunity: resources available for children and affordable higher education. The second two may come as more of a surprise: business ownership and inheritances. 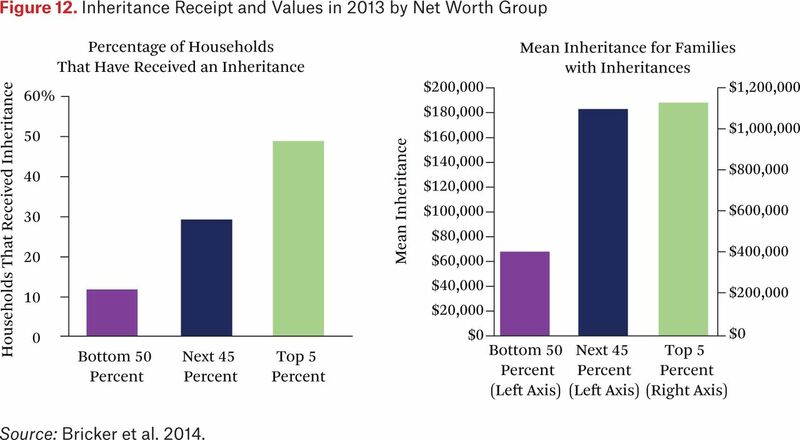 Like most sources of wealth, family ownership of businesses and inheritances are concentrated among households at the top of the distribution. But both of these are less concentrated and more broadly distributed than other forms of wealth, and there is some basis for thinking that they may also play a role in providing economic opportunities to a considerable number of families below the top. In focusing on these four building blocks, I do not mean to suggest that they account for all economic opportunity, but I do believe they are all significant sources of opportunity for individuals and their families to improve their economic circumstances. I start with the basics about widening inequality, drawing heavily on a trove of data generated by the Federal Reserve's triennial Survey of Consumer Finances (SCF), the latest of which was conducted in 2013 and published in September 2014 (see Bricker et al. 2014).1 The SCF is broadly consistent with other data that show widening wealth and income inequality over the past several decades, but I use the SCF because it offers the added advantage of specific detail on income, wealth, and debt for each of six thousand households surveyed.2 This detail from family balance sheets provides a glimpse of the relative access to the four sources of opportunity I discuss. Although the recent trend of widening income and wealth inequality is clear, the implications for a particular family partly depend on whether that family's living standards are rising as its relative position changes. There have been some times of relative prosperity, where income has grown for most households but inequality has widened because the gains were proportionally larger for those at the top; widening inequality might not be as great a concern if living standards improve for most families. That was the case for much of the 1990s, when real incomes were rising for most households. At other times, however, inequality has widened because income and wealth grew for those at the top and stagnated or fell for others. At still other times, inequality has widened when incomes were falling for most households, but the declines toward the bottom were proportionally larger. Unfortunately, the past several decades of widening inequality has often involved stagnant or falling living standards for many families. The distribution of wealth is even more unequal than that of income, and the SCF shows that wealth inequality has increased more than income inequality since 1989. As shown in figure 3, the wealthiest 5 percent of American households held 54 percent of all wealth reported in the 1989 survey. Their share rose to 61 percent in 2010 and reached 63 percent in 2013. By contrast, the rest of those in the top half of the wealth distribution—families that in 2013 had a net worth between $81,000 and $1.9 million—held 43 percent of wealth in 1989 and only 36 percent in 2013. 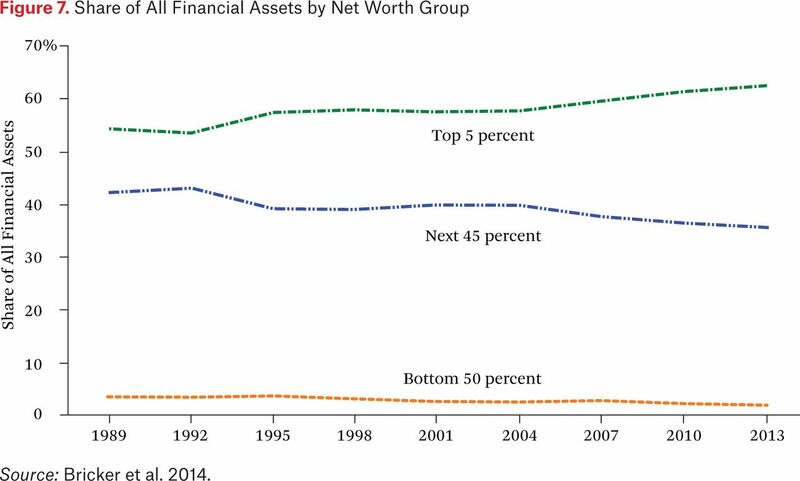 The lower half of households by wealth held just 3 percent of wealth in 1989 and only 1 percent in 2013. To put that in perspective, figure 4 shows that the average net worth of the lower half of the distribution, representing 62 million households, was $11,000 in 2013.6 About one-fourth of these families reported zero wealth or negative net worth, and a significant fraction of those said they were “underwater” on their home mortgages, owing more than the value of the home.7 This $11,000 average is 50 percent lower than the average wealth of the lower half of families in 1989, adjusted for inflation. Average real wealth rose gradually for these families for most of those years, then dropped sharply after 2007. 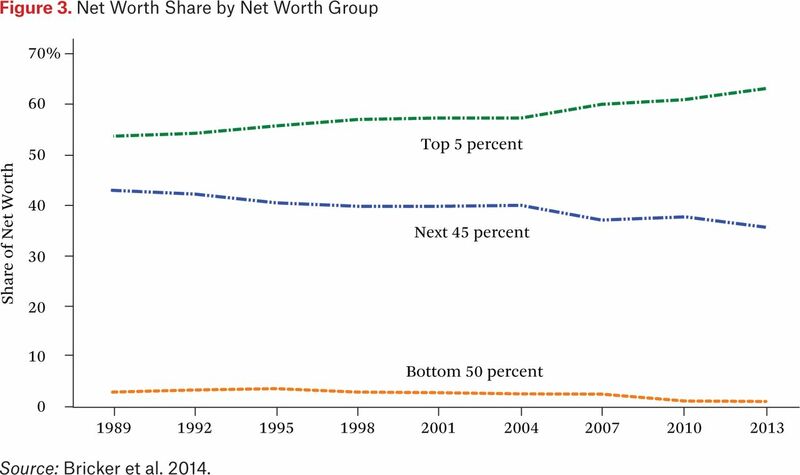 Figure 5 shows that average wealth also grew steadily for the next 45 percent of households before the crisis but did not fall nearly as much afterward. Those next 45 percent of households saw their wealth, measured in 2013 dollars, grow from an average of $323,000 in 1989 to $516,000 in 2007 and then fall to $424,000 in 2013, a net gain of about one-third over twenty-four years. Meanwhile, the average real wealth of families in the top 5 percent has nearly doubled, on net—from $3.6 million in 1989 to $6.8 million in 2013. Housing wealth—the net equity held by households, consisting of the value of their homes minus their mortgage debt—is the most important source of wealth for all but those at the very top.8 It accounted for three-fifths of wealth in 2013 for the lower half of families and two-fifths for the next 45 percent, but only one-fifth for the top 5 percent. 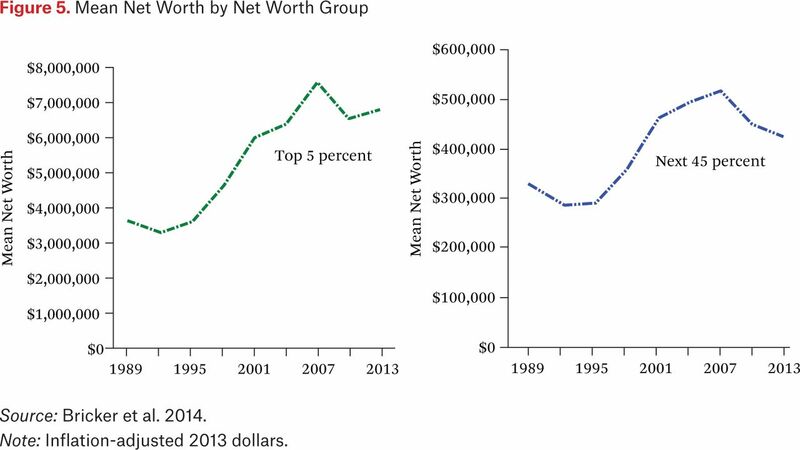 The share of housing in total net worth for all three groups has not changed much since 1989. Given that housing accounts for a larger share of wealth for those in the bottom half of the wealth distribution, their overall wealth is affected more by changes in home prices. Furthermore, homeowners in the bottom half have been more highly leveraged on their homes, amplifying this difference. As a result, although the SCF shows that all three groups saw proportionally similar increases and subsequent declines in home prices from 1989 to 2013, the effects on net worth were greater for those in the bottom half of households by wealth. Foreclosures and the dramatic fall in house prices affected many of these families severely, pushing them well down the wealth distribution. 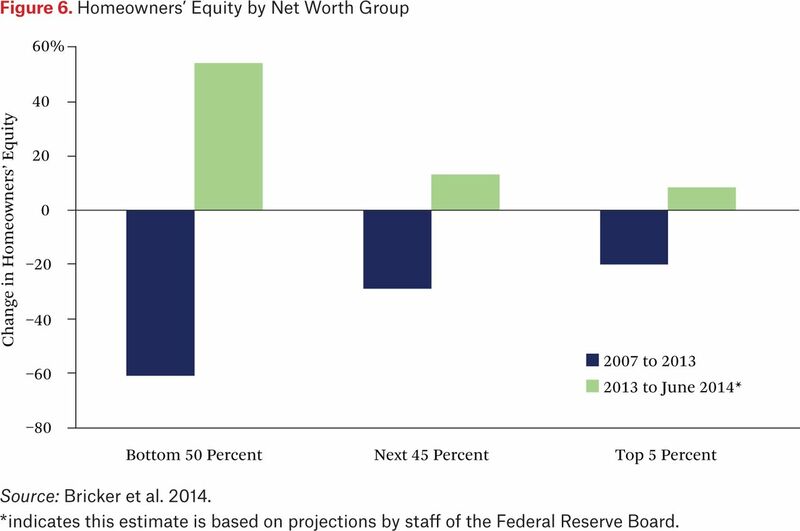 Figure 6 shows that homeowners in the bottom half of households by wealth reported 61 percent less home equity in 2013 than in 2007. The next 45 percent reported a 29 percent loss of housing wealth, and the top 5 percent lost 20 percent. Fortunately, rebounding housing prices in 2013 and 2014 have restored a good deal of the loss in housing wealth, with the largest gains for those toward the bottom. Based on rising home prices alone and not counting possible changes in mortgage debt or other factors, Federal Reserve staff estimate that between 2013 and mid-2014, average home equity rose 49 percent for the lowest half of families by wealth that own homes.9 The estimated gains are somewhat less for those with greater wealth.10 Homeowners in the bottom 50 percent, who had an average overall net worth of $25,000 in 2013, would have seen their net worth increase to an average of $33,000 due solely to home price gains since 2013, a 32 percent increase. Those are the basics on wealth and income inequality from the SCF. Other research tells us that inequality tends to persist from one generation to the next. For example, one study that divides households by income found that four in ten children raised in families in the lowest-income fifth of households remain in that quintile as adults (see Pew Charitable Trusts 2012). Fewer than one in ten children of families at the bottom later reach the top quintile. The story is flipped for children raised in the highest-income households: when they grow up, four in ten stay at the top and fewer than one in ten fall to the bottom. Research also indicates that economic mobility in the United States has not changed much in the last several decades; that mobility is lower in the United States than in most other advanced countries; and, as noted earlier, that economic mobility and income inequality among advanced countries are negatively correlated (see Chetty et al. 2014; see also OECD 2010; Krueger 2012). An important factor influencing intergenerational mobility and trends in inequality over time is economic opportunity. We can measure overall mobility and inequality, but summarizing opportunity is harder, which is why I focus on some important sources of opportunity—the four building blocks mentioned earlier. Two of those are so significant that you might call them cornerstones of opportunity, and both are largely related to education. The first of these cornerstones I would describe more fully as “resources available to children in their most formative years.” The second is higher education that students and their families can afford. Two additional sources of opportunity are evident in the SCF. They affect fewer families than the two cornerstones I have just identified, but enough families and to a sufficient extent that I believe they are also important sources of economic opportunity. The third building block, as shown by the SCF, is ownership of a private business.13 This usually means ownership and sometimes direct management of a family business. The fourth source of opportunity is inherited wealth. As one would expect, inheritances are concentrated among the wealthiest families, but the SCF indicates they may also play an important role in the opportunities available to others. According to the SCF, the gap in wealth between families with children at the bottom and the top of the distribution has been growing steadily over the past twenty-four years, but that pace has accelerated recently. 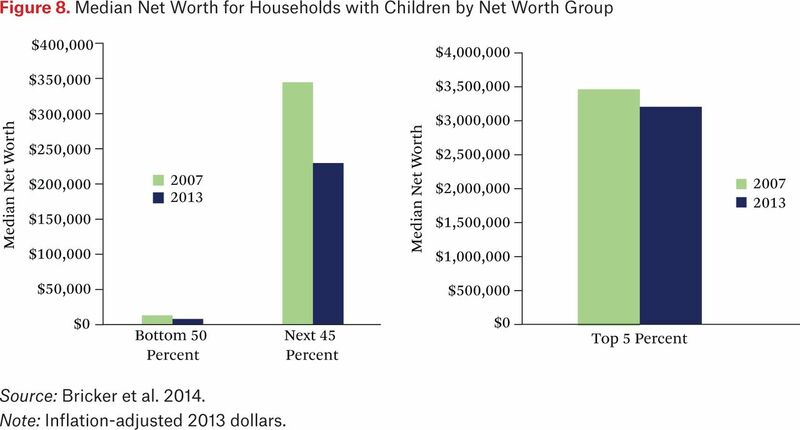 Figure 8 shows that the median wealth for families with children in the lower half of the wealth distribution fell from $13,000 in 2007 to $8,000 in 2013, after adjusting for inflation, a loss of 40 percent.15 These wealth levels look small alongside the much higher wealth of the next 45 percent of households with children. But these families also saw their median wealth fall dramatically—by one-third in real terms—from $344,000 in 2007 to $229,000 in 2013. The top 5 percent of families with children saw their median wealth fall only 9 percent, from $3.5 million in 2007 to $3.2 million in 2013, after inflation. For families below the top, public funding plays an important role in providing resources to children that influence future levels of income and wealth. Such funding has the potential to help equalize these resources and the opportunities they confer. Social safety-net spending is an important form of public funding that helps offset disparities in family resources for children. Spending for income security programs since 1989 and until recently was fairly stable, ranging between 1.2 and 1.7 percent of gross domestic product (GDP), with higher levels in this range related to recessions. However, such spending rose to 2.4 percent of GDP in 2009 and 3 percent in 2010.16 Researchers estimate that the increase in the poverty rate because of the recession would have been much larger without the effects of income security programs (see Thompson and Smeeding 2013). Public funding of education is another way governments can help offset the advantages some households have in resources available for children. One of the most consequential examples is early childhood education. Research shows that children from lower-income households who get good-quality prekindergarten education are more likely to graduate from high school and attend college as well as hold a job and have higher earnings, and they are less likely to be incarcerated or receive public assistance (see Heckman et al. 2010, and Belfield et al. 2006). Figure 9 shows that access to quality early childhood education has improved since the 1990s, but it remains limited—41 percent of children were enrolled in state or federally supported programs in 2013. Gains in enrollment have stalled since 2010, as has growth in funding, in both cases because of budget cuts related to the Great Recession. These cuts have reduced per-pupil spending in state-funded programs by 12 percent after inflation, and access to such programs, most of which are limited to lower-income families, varies considerably from state to state and within states, because local funding is often important.17 In 2010, the United States ranked twenty-eighth out of thirty-eight advanced countries in the share of four-year-olds enrolled in public or private early childhood education (see OECD 2013b). Similarly, the quality and the funding levels of public education at the primary and secondary levels vary widely, and this unevenness limits public education's equalizing effect. The United States is one of the few advanced economies in which public education spending is often lower for students in lower-income households than for students in higher-income households (see OECD 2013a). Some countries strive for more or less equal funding, and others actually require higher funding in schools serving students from lower-income families, expressly for the purpose of reducing inequality in resources for children. A major reason the United States is different is that we are one of the few advanced nations that funds primary and secondary public education mainly through subnational taxation. Half of U.S. public school funding comes from local property taxes, a much higher share than in other advanced countries, and thus the inequalities in housing wealth and income I have described enhance the ability of more-affluent school districts to spend more on public schools. Some states have acted to equalize spending to some extent in recent years, but there is still significant variation among and within states. Even after adjusting for regional differences in costs and student needs, there is wide variation in public school funding in the United States (Education Week 2014). Along with other data, the SCF shows that most students and their families are having a harder time affording college. College costs have risen much faster than income for the large majority of households since 2001 and have become especially burdensome for households in the bottom half of the earnings distribution. Higher education has been and remains a potent source of economic opportunity in America, but I fear the large and growing burden of paying for it may make it harder for many young people to take advantage of the opportunity higher education offers. For many people, the opportunity to build a business has long been an important part of the American dream. The SCF shows that ownership of private businesses—in addition to housing and financial assets—is a significant source of wealth and can be a vital source of opportunity for many households to improve their economic circumstances and position in the wealth distribution. Owning a business is risky, and most new businesses close within a few years. But research shows that business ownership is associated with higher levels of economic mobility (see, for example, Fairlie 2004; Holtz-Eakin, Rosen, and Weathers 2000). However, it appears that it has become harder to start and build businesses. The pace of new business creation has gradually declined over the past couple of decades, and the number of new firms declined sharply from 2006 through 2009 (see U.S. Census Bureau 2015; for analysis documenting the decline in new and young firms, see Haltiwanger, Jarmin, and Miranda 2012; for a discussion of the link between a decline in young firms and constrained credit access, see Siemer 2014). The latest SCF shows that the percentage of the next 45 percent who own a business has fallen to a twenty-five-year low, and equity in those businesses, adjusted for inflation, is at its lowest point since the mid-1990s. One reason to be concerned about the apparent decline in new business formation is that it may serve to depress the pace of productivity, real wage growth, and employment (see Davis and Haltiwanger 2014). Another reason is that a slowdown in business formation may threaten what I believe likely has been a significant source of economic opportunity for many families below the very top in income and wealth. Along with other economic advantages, it is likely that large inheritances play a role in the fairly limited intergenerational mobility I described earlier (see Piketty 2014). But inheritances are also common among households below the top of the wealth distribution and sizable enough that I believe they may well play a role in helping these families economically. The average inheritance reported by those in the top 5 percent who had received them was $1.1 million. That amount dwarfs the $183,000 average among the next 45 percent and the $68,000 reported among the bottom half. But compared with the typical wealth of these households, the additive effect of bequests of this size is significant for the millions of households below the top 5 percent that receive them. The average age for receiving an inheritance is forty, when many parents are trying to save for and secure the opportunities of higher education for their children, move up to a larger home or one in a better neighborhood, launch a business, switch careers, or perhaps relocate to seek more opportunity. Considering the overall picture of limited resources for most families I have described, I think the effects of inheritances for the sizable minority below the top that receive one are likely a significant source of economic opportunity. These examples only just touch the surface of the important topic of economic opportunity, and other papers in this volume address additional aspects. Research about the causes and implications of inequality is ongoing, and I hope that this volume helps spur further study of economic opportunity and its effects on economic mobility. Using the SCF and other sources, I have offered some observations about how access to four specific sources of opportunity may vary across households, but I cannot offer any conclusions about how much these factors influence income and wealth inequality. I do believe that these are important questions, and I hope that further research will help answer them. This article was presented as the keynote address at the fifty-eighth economic conference at the Federal Reserve Bank of Boston on October 17, 2014. ↵In the SCF, questions about assets are based on these values at the time of the survey. Because most interviews were completed between April and December 2013, some of the asset values do not reflect price increases experienced in late 2013, and none reflect increases in 2014. Income questions in the SCF refer to the prior calendar year, so the 2013 survey reports 2012 income. More complete data and documentation pertaining to the SCF is available at the Federal Reserve website (see http://www.federalreserve.gov/econresdata/scf/scfindex.htm). ↵2. Households and families are used interchangeably in these remarks because the SCF uses both interchangeably to describe its respondents. ↵3. The share of income that went to the top 5 percent of households—a threshold of $230,000 in gross income in 2013—rose from 31 percent of income reported by all respondents in 1989 to 37 percent in 2007. The income share for this group fell in the financial crisis, to 34 percent in 2010, then rose in the recovery, regaining a 37 percent share in 2013. ↵4. The top half of the distribution, except for the top 5 percent, earned 53 percent of all income in 1989 but only 51 percent in 2010. In 2013, households in the next 45 percent had incomes between $47,000 and $230,000. Although income has rebounded for the top 5 percent in the recovery, the share that went to the next 45 percent declined further to 49 percent in 2013. The bottom half of the distribution saw their share of income fall from 16 percent in 1989 to 15 percent in 2007, edge up in 2010, and then reach a new low for the 2013 survey at 14 percent. ↵5. Largely because of losses in income from financial holdings, the share of total income received by the top 5 percent of households fell 3 percentage points from 2007 to 2010, with the next 45 percent and lower half of households each gaining about half of that share. Some of the nominal income losses for households below the top 5 percent were offset by larger-than-normal transfer payments during the recession. ↵6. All SCF income and wealth data prior to the 2013 survey are adjusted for inflation by expressing the values in 2013 dollars. ↵7. In the 2013 SCF, 17 percent of all families reporting zero or negative net worth also reported they were underwater on their home mortgages. ↵8. Housing wealth includes the net equity in primary residences and other residential real estate. ↵9. The house price data used are from CoreLogic, and data track price changes at the Core Based Statistical Area level between the survey month in 2013 and June 2014. The average increase in home prices over this period was 8 percent. No adjustments are made to account for possible changes in mortgage leverage. ↵10. Home price gains in 2013 and 2014 are estimated to have raised the home equity of home-owning households in the next 45 percent of households in the wealth distribution by 12 percent, and by 9 percent for home-owning households in the top 5 percent. ↵11. The SCF defines financial assets as liquid assets, certificates of deposit, directly held pooled investment funds, stocks, bonds, quasi-liquid assets (including retirement accounts), savings bonds, whole life insurance, other managed assets, and other financial assets. ↵12. In 1989, the top 5 percent of households held 54 percent of financial assets, the next 45 percent (that is, home-owning households in the 50th through 95th percentiles of the wealth distribution) held 42 percent, and the bottom half held 4 percent. ↵13. Business assets in the SCF include both actively and non-actively managed businesses but do not include ownership of publicly traded stock. ↵14. Homeownership by parents is strongly associated with economic success for children (see Boehm and Schlottmann 1999). Ninety-seven percent of top-earning families with children own a home, compared with fewer than half of the bottom 50 percent; educational attainment of parents is strongly predictive of outcomes for children that determine earnings (see Douglas-Hall and Chau 2007). A considerable body of literature establishes the correlation between educational attainment of parents and their children. Other research has identified that this relationship is causal (see, for example, Oreopoulos, Page, and Stevens 2006). Eighty-six percent of top-earning households in the SCF with children are headed by a college graduate, compared with 12 percent in the bottom half of households with children; children raised by a single parent earn less as adults (see Powell and Parcel 1997). Only 4 percent of top-earning households with children are headed by unmarried parents, compared with 47 percent for the lower half of households with children. ↵15. Distributional statistics for families with children are based on a sorting of only families with children. ↵16. Figures derived from Congressional Budget Office historic budget data. Income security programs include UI, SSI, SNAP EITC, and other family support and nutrition programs. ↵17. The share of four-year-olds in state-funded pre-K programs increased from 14 percent in 2002 to 27 percent in 2010 but has been 28 percent since. Head Start enrollments have been fairly steady since 2005. Forty-one percent of four-year-olds were enrolled in federally funded Head Start or state-funded pre-K education programs in 2013 (see Barnett et al. 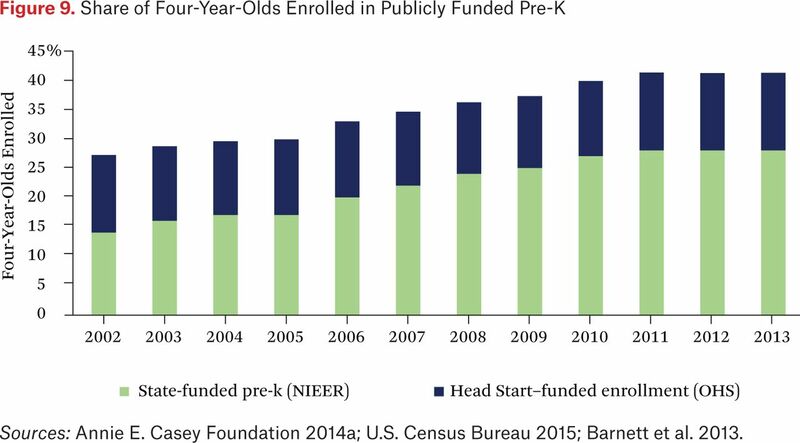 2013; for analysis of Head Start enrollment by age, see Annie E. Casey Foundation 2014b). ↵18. Better and more-experienced teachers tend to move to better-resourced schools, including those with more active outside funding, or those with more-advantaged students, such as magnet schools. Even within schools, more-experienced and higher-performing teachers are more likely to teach Advanced Placement classes which tend to serve more-advantaged students. The result is that lower-income and lower-achieving students are more likely to be taught by less experienced and lower-performing teachers (see Clotfelter et al. 2007; Clotfelter, Ladd, and Vigdor 2005; Lankford, Loeb, and Wyckoff 2002). ↵19. Taking into account the cost of paying for education and years spent in college and not working, economists at the Federal Reserve Bank of New York estimate that the lifetime return to a college degree is 15 percent (see Abel and Deitz 2014). ↵20. Education debt in the SCF reflects the total amount of debt outstanding at the time of the survey. ↵21. 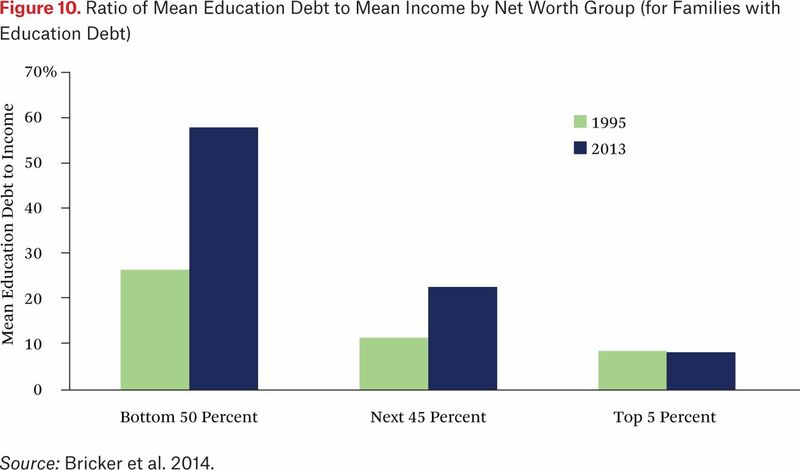 Education debt-to-income ratio is calculated based on what SCF respondents reported as their usual income. Numbers are for families with education debt. ↵22. The SCF does not ask households whether they started businesses that closed, so reported business ownership and wealth is largely related only to those businesses that succeed. ↵23. Distributional statistics for business ownership and assets exclude outliers with large negative net worth. ↵24. 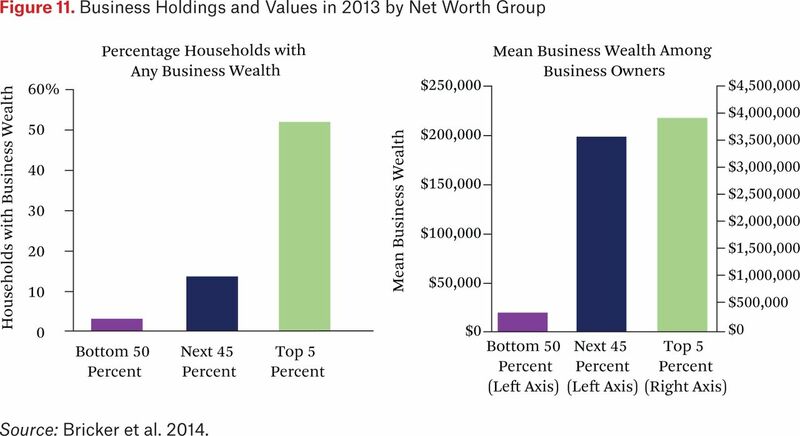 Business wealth took a big hit due to the recession and has only partly recovered for most families. For the bottom half of the distribution, the $20,000 average in business wealth in 2013 was down from $29,000, after adjusting for inflation, in 2007. The nearly $200,000 held by the next 45 percent with businesses was down from $228,000 in 2007. 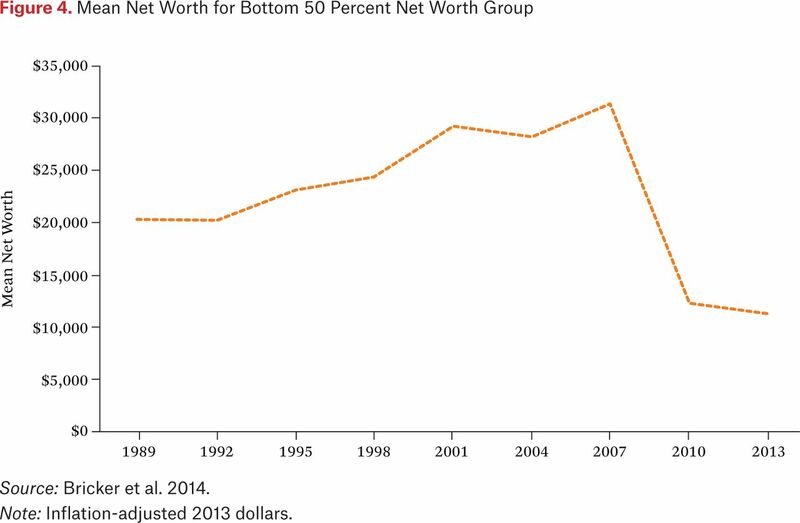 The $4 million in business wealth of the top 5 percent in 2013 was down, in real terms, from $4.4 million in 2007. ↵25. Reported inheritances can have been received at any point in the respondent's life. As with other forms of wealth cited in these remarks, inheritances have been adjusted for inflation and are expressed in 2013 dollars. Copyright © 2016 by Russell Sage Foundation. All rights reserved. Printed in the United States of America. No part of this publication may be reproduced, stored in a retrieval system, or transmitted in any form or by any means, electronic, mechanical, photocopying, recording, or otherwise, without the prior written permission of the publisher. Reproduction by the United States Government in whole or in part is permitted for any purpose. This article was presented as the keynote address at the fifty-eighth economic conference at the Federal Reserve Bank of Boston on October 17, 2014. Direct correspondence to: Janet L. Yellen at 20th Street and Constitution Ave. NW, Washington, D.C. 20551. Open Access Policy: RSF: The Russell Sage Foundation Journal of the Social Sciences is an open access journal. This article is published under a Creative Commons Attribution-NonCommercial-NoDerivs 3.0 Unported License.
. 2014. “Do the Benefits of College Still Outweigh the Costs?” Current Issues in Economics and Finance 20(3): 1–9. Accessed December 8, 2015. http://www.newyorkfed.org/research/current_issues/ci20-3.pdf. Administration for Children and Families (ACF). 2014. “Head Start Program Facts Fiscal Year 2013.” Washington: U.S. Department of Health and Human Services. Accessed December 8, 2015. http://eclkc.ohs.acf.hhs.gov/hslc/data/factsheets/docs/hs-program-fact-sheet-2013.pdf. Almond, Douglas, and Janet Currie. 2011. “Human Capital Development before Age Five.” In Handbook of Labor Economics, vol. 4B, edited by David Card and Orley Ashenfelter. Amsterdam: North Holland. Annie E. Casey Foundation. 2014a. 2014 KIDS COUNT Data Book. Baltimore, Md. : The Annie E. Casey Foundation. Accessed January 8, 2016. http://www.aecf.org/m/resourcedoc/aecf-2014kidscountdatabook-2014.pdf. Annie E. Casey Foundation. 2014b. “KIDS COUNT Data Center.” Baltimore, Md. : The Annie E. Casey Foundation. Accessed January 8, 2016. http://datacenter.kidscount.org.
. 2011. 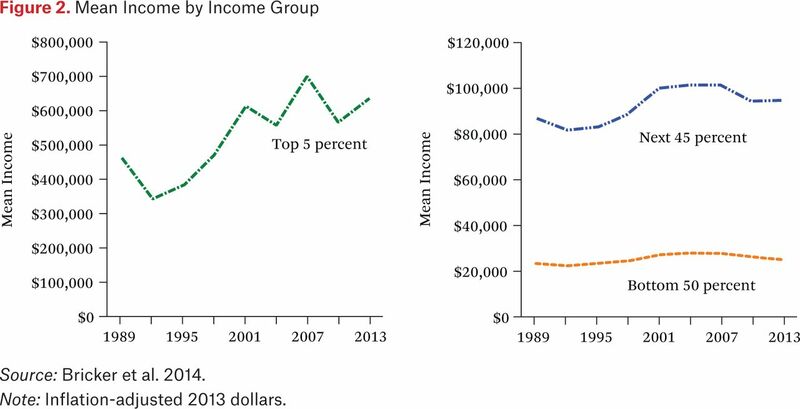 “Top Incomes in the Long Run of History.” Journal of Economic Literature 49(1): 3–71. Barnett, W. Steven, Megan E. Carolan, James H. Squires, and Kirsty Clarke Brown. 2013. The State of Preschool 2013: State Preschool Yearbook. New Brunswick, N.J.: National Institute for Early Education Research. Accessed December 8, 2015. http://www.nieer.org/sites/nieer/files/yearbook2013.pdf. Baum, Sandy. 2014. “Higher Education Earnings Premium: Value, Variation, and Trends.” Washington, D.C.: The Urban Institute. Accessed December 8, 2015. http://www.urban.org/UploadedPDF/413033-Higher-Education-Earnings-Premium-Value-Variation-and-Trends.pdf.
. 2006. “The High/Scope Perry Preschool Program: Cost-Benefit Analysis Using Data from the Age-40 Followup.” Journal of Human Resources 41(1): 162–90.
. 1999. “Does Home Ownership by Parents Have an Economic Impact on Their Children?” Journal of Housing Economics 8(3): 217–32. Bricker, Jesse, Lisa J. Dettling, Alice Henriques, Joanne W. Hsu, Kevin B. Moore, John Sabelhaus, Jeffrey Thompson, and Richard A. Windle. 2014. “Changes in U.S. Family Finances from 2010 to 2013: Evidence from the Survey of Consumer Finances.” Federal Reserve Bulletin 100 (September): 1–41. Accessed December 8, 2015. http://www.federalreserve.gov/pubs/bulletin/2014/articles/scf/scf.htm.
. 2014. “Measuring the Impacts of Teachers II: Teacher Value-Added and Student Outcomes in Adulthood.” American Economic Review 104(9): 2633–79.
. 2014. “Is the United States Still a Land of Opportunity? Recent Trends in Intergenerational Mobility.” American Economic Review 104(5): 141–47.
. 2005. “Who Teaches Whom? Race and the Distribution of Novice Teachers.” Economics of Education Review 24(4): 377–92.
. 2007. “High Poverty Schools and the Distribution of Teachers and Principals.” North Carolina Law Review 85(2): 1345–79. Davis, Steven J., and John Haltiwanger. 2014. “Labor Market Fluidity and Economic Performance.” NBER working paper no. 20479. Cambridge, Mass. : National Bureau of Economic Research. Douglas-Hall, Ayana, and Michelle Chau. 2007. “Parents’ Low Education Leads to Low Income, Despite Full-Time Employment.” Fact Sheet, November. New York: National Center for Children in Poverty. Accessed December 8, 2015. http://www.nccp.org/publications/pub_786.html. Education Week. 2014. Quality Counts 2014: District Disruption and Revival. Bethesda, Md. : Editorial Projects in Education. Accessed December 8, 2015. http://www.edweek.org/ew/toc/2014/01/09/index.html.
. 2004. “Earnings Growth Among Young Less-Educated Business Owners.” Industrial Relations 43(3): 634–59. Haltiwanger, John, Ron Jarmin, and Javier Miranda. 2012. “Where Have All the Young Firms Gone?” Business Dynamics Statistics Briefing. Washington: U.S. Census Bureau. Accessed December 8, 2015. http://www.census.gov/ces/pdf/BDS_StatBrief6_Young_Firms.pdf.
. 2011. “The Economic Value of Higher Teacher Quality.” Economics of Education Review 30(3): 466–79.
. 2010. “An Effective Teacher in Every Classroom: A Lofty Goal, But How to Do It?” Education Next 10(3): 46–52.
. 2010. “The Rate of Return to the HighScope Perry Preschool Program.” Journal of Public Economics 94 (1–2): 114–28.
. 2000. “Horatio Alger Meets the Mobility Tables.” Small Business Economics 14(4): 243–74. Isenberg, Eric, Jeffrey Max, Philip Gleason, Liz Potamites, Robert Santillano, Heinrich Hock, and Michael Hansen. 2013. Access to Effective Teaching for Disadvantaged Students. NCEE Report 2014–4001. Washington: U.S. Department of Education. Accessed December 8, 2015. http://ies.ed.gov/ncee/pubs/20144001/pdf/20144001.pdf. Krueger, Alan B. 2012. “The Rise and Consequences of Inequality in the United States.” Speech delivered at the Center for American Progress. Washington, D.C. (January 12, 2012). Accessed December 8, 2015. http://www.whitehouse.gov/sites/default/files/krueger_cap_speech_final_remarks.pdf.
. 2002. “Teacher Sorting and the Plight of Urban Schools: A Descriptive Analysis.” Education Evaluation and Policy Analysis 24(1): 37–62. Lindert, Peter H., and Jeffrey G. Williamson. 2012. “American Incomes 1774–1860.” NBER working paper no. 18396. Cambridge, Mass: National Bureau of Economic Research. Morelli, Salvatore, Timothy Smeeding, and Jeffrey Thompson. 2015. “Post-1970 Trends in Within-Country Inequality and Poverty: Rich and Middle-Income Countries.” In Handbook of Income Distribution, vol. 2A, edited by Anthony B. Atkinson and François Bourguignon. Amsterdam: North Holland.
. 2006. “The Intergenerational Effects of Compulsory Schooling.” Journal of Labor Economics 24(4): 729–60. Organization for Economic Cooperation and Development (OECD). 2010. “A Family Affair: Intergenerational Social Mobility Across OECD Countries.” In Economic Policy Reforms: Going for Growth 2010. Paris: OECD. Accessed December 8, 2015. http://www.oecd.org/tax/public-finance/chapter%205%20gfg%202010.pdf. Organization for Economic Cooperation and Development (OECD). 2013a. Education at a Glance 2013: OECD Indicators. Paris: OECD. Accessed December 8, 2015. http://dx.doi.org/10.1787/eag-2013-en. Organization for Economic Cooperation and Development (OECD). 2013b. “How Do Early Childhood Education and Care (ECEC) Policies, Systems and Quality Vary Across OECD Countries?” Education Indicators in Focus 11 (February). Paris: OECD. Accessed December 8, 2015. http://www.oecd.org/education/skills-beyond-school/EDIF11.pdf. Pew Charitable Trusts. 2012. “Pursuing the American Dream: Economic Mobility Across Generations.” Washington, D.C.: Pew Charitable Trusts. Accessed December 8, 2015. http://www.pewtrusts.org/∼/media/legacy/uploadedfiles/pcs_assets/2012/PursuingAmericanDreampdf.pdf. Piketty, Thomas. 2014. Capital in the 21st Century. Translated by Arthur Goldhammer. Cambridge, Mass. : Harvard University Press.
. 1997. “Effects of Family Structure on the Earnings Attainment Process: Differences by Gender.” Journal of Marriage and Family 59(2): 419–33. Saez, Emmanuel, and Gabriel Zucman. 2014. “Wealth Inequality in the United States Since 1913: Evidence from Capitalized Income Tax Data.” NBER working paper no. 20625. Cambridge, Mass. : National Bureau of Economic Research. Siemer, Michael. 2014. “Firm Entry and Employment Dynamics in the Great Recession.” Finance and Economics Discussion Series no. 2014–56. Washington, D.C.: Board of Governors of the Federal Reserve System. Accessed December 8, 2015. http://www.federalreserve.gov/pubs/feds/2014/201456/201456pap.pdf. Thompson, Jeffrey P., and Timothy M. Smeeding. 2013. “Inequality and Poverty in the United States: The Aftermath of the Great Recession.” Finance and Economics Discussion Series no. 2013–51. Washington, D.C.: Board of Governors of the Federal Reserve System. Accessed December 8, 2015. http://www.federalreserve.gov/pubs/feds/2013/201351/201351pap.pdf. U.S. Census Bureau. 2015. “Business Dynamics Statistics.” Washington: U.S. Department of Commerce. Accessed December 8, 2015. http://www.census.gov/ces/dataproducts/bds/data.html.